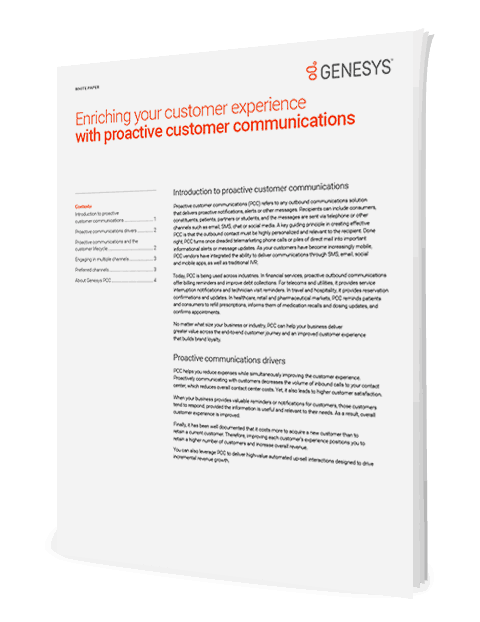 Proactive Customer Communications (PCC) is any outbound communications solution that delivers proactive notifications, alerts, or other messages. Done right, it turns once-dreaded telemarketing calls or ignored direct mail into important alerts and updates. A key to creating effective PCC is that it must be highly personalized, relevant to the recipient and delivered through the channels customers want to use. No matter what size your business or industry you are in, PCC can help you improve your customer experience. Download the white paper to see what it can do for you.